This engaging trio of percussion, violin, and guitar/electronics, creates sonically rich improvised music that is transforming and evocative. Combining high musicianship, sensitive interaction, a dedication to unencumbered personal expression, and an approach to free improvisation that draws broadly from abstract contemporary to the elemental past, Richard Carr, Mike Nord, and Georg Hofmann infuse the spirit of jazz into an improvised music that moves beyond stylistic labels to a place that is liberating to both musicians and audiences alike. 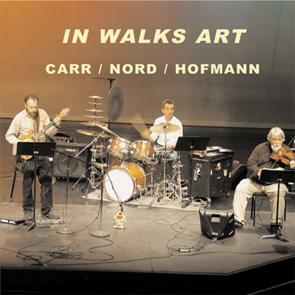 On this CD the trio Carr Nord Hofmann is augmented by the pianist Art Maddox and the saxophonist Randy Kem.